Playing Time about 30 min. In an abandoned warehouse, a band of gangsters is splitting their latest haul, but they can't come to an agreement on the split. It's time to let the guns do the talking, and soon everyone is aiming at everyone… The richest surviving gangster wins the game! 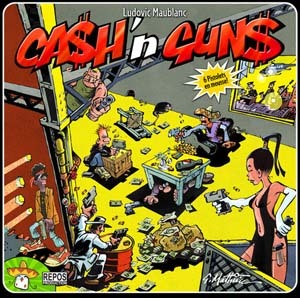 CA$H'n GUN$ will make you relive the best scenes of your favorite gangster movies. This box includes the initiation game, the basic rules with the 'Super Powers' and the 'A cop in the Mafia' advanced rules. Fun, bluff and tough negotiations lie ahead, but will you dare to play? It's lethally fun!